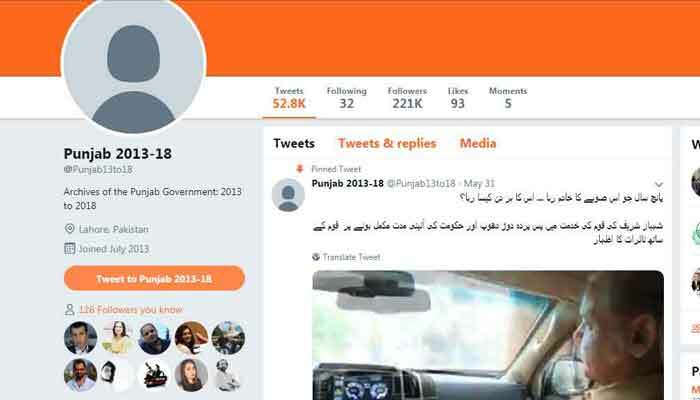 KARACHI: A few months ago Punjab government’s official Twitter account was reportedly deleted instead of being handed over to the newly installed Pakistan Tehreek-e-Insaf government but the same handle has now resurfaced as archive of PML-N’s tenure. There was a lot of hue and cry then on social media, on the way this was handled by the previous regime of Chief Minster Shahbaz Sharif. Imran Ghazali, who has been head of social media wing of PTI and is attending key official meetings on policy making, on Monday identified the twitter account as archive of Shahbaz Sharif’s tenure 2013-2018. Ghazali stated that if PMLN wanted to protect the content posted during their tenure then it should have been archived via @twitter rather than how they tried to hijack the account and deactivated it. The account has same number of followers and tweets but its handle has been changed. This brings another question for the new government that if they will try to take this account back or not and if they will proceed for any criminal misconduct based on the fact that a lot of tax payers’ money was invested in the promotion of this account. Only time will tell how serious provincial government of CM Usman Buzdar is to get that account back.